Want to change it up a little this year? 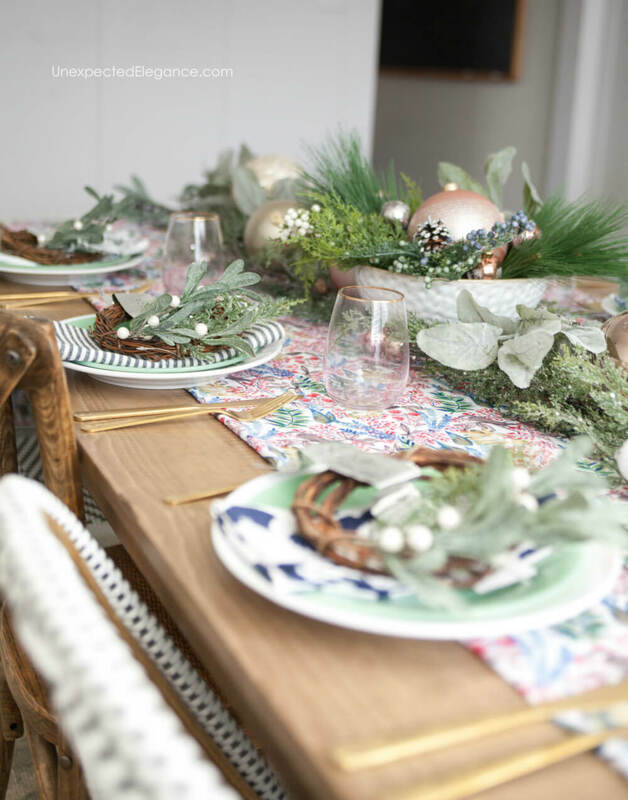 Check out this holiday tablescape using non-traditional colors for a different color scheme this year! The holidays are finally here, let the festivities begin! I can honestly say this is my most favorite time of the year. I love all the gatherings with friends and family, surprises in the form of gifts and the eventual slow-down that comes at the end of December. It all makes this season magical for me. One of the things I love most is having people over and sitting around the table to eat a meal together. This doesn’t happen often enough for the majority of the year, but come November there are more opportunities…mostly because we make the time! 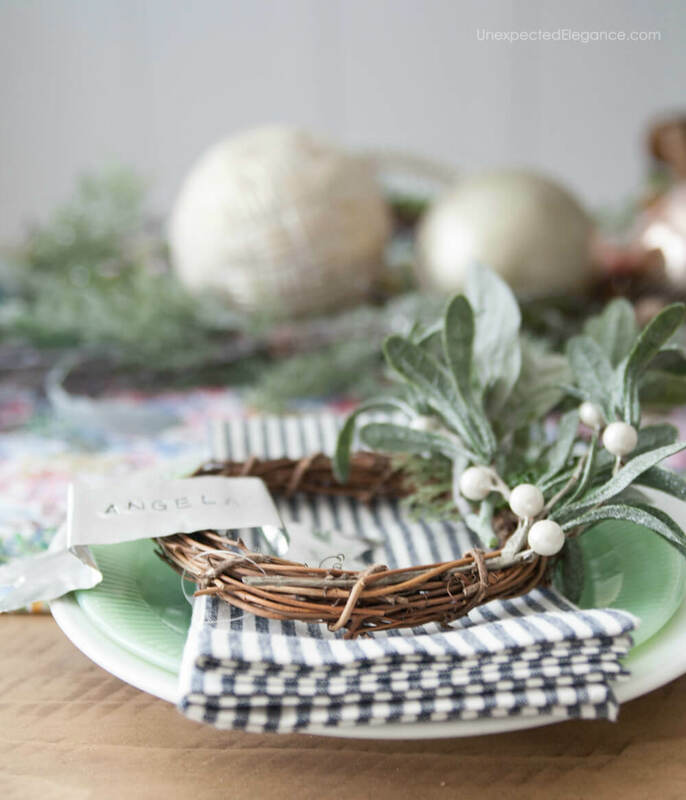 I’ve partnered with JOANN this year for my holiday tablescape using non-traditional colors. As fall turns to winter, I like to slowly transition my decor. Non-traditional holiday colors are perfect to use year-round. 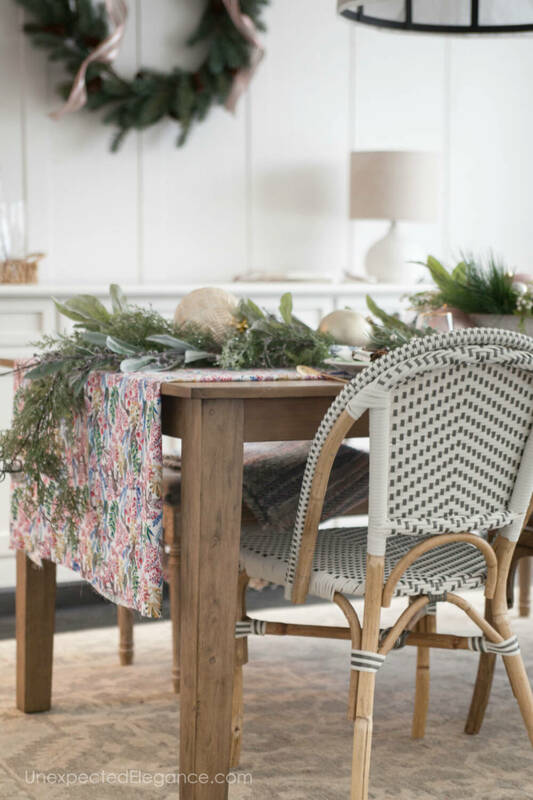 I think the mixture of different patterns gives decor interest, but to give it a holiday feel there are two things I always to add: greenery and ornaments. JOANN carries a great selection of faux greenery. It looks so real that your guests won’t know the difference. The best part is that it won’t dry out and you can reuse it next year! 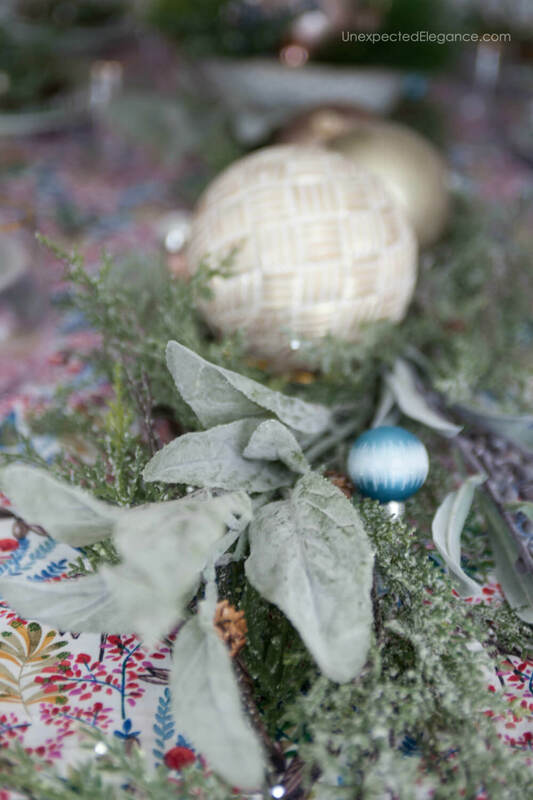 I like to use a garland like this one down the center of the table, then add in other sprigs to give it some depth. Once I’ve laid down the greenery, I sprinkle in a mixture of ornaments. Here are the ornaments I used for this tablecape: large rose gold , small blue, and small rose gold. The runner is just a piece of fabric I got from JOANN (HERE) that folded to hide the edges! 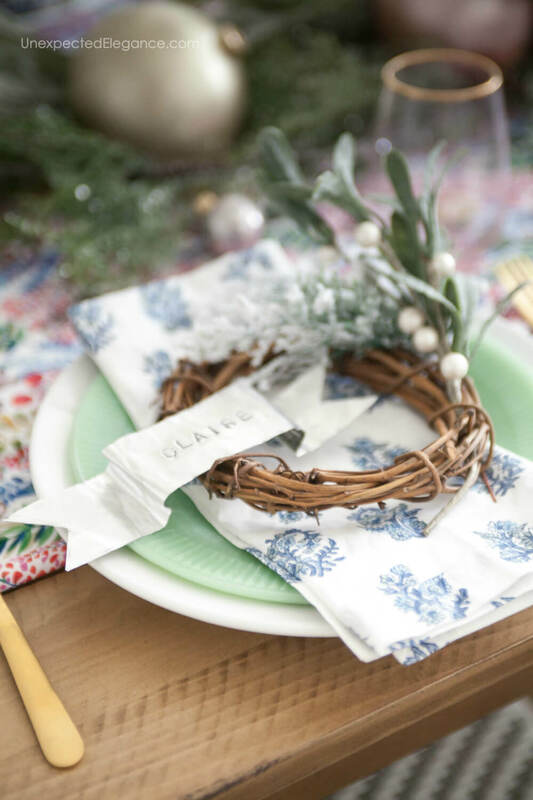 At each place setting, I like to add a small gift that each guest can bring home. This doesn’t have to be expensive or take a lot of time to create but is something special for each person. For this table, I made small wreaths. They would make a great accessory on a shelf or an ornament for the tree. 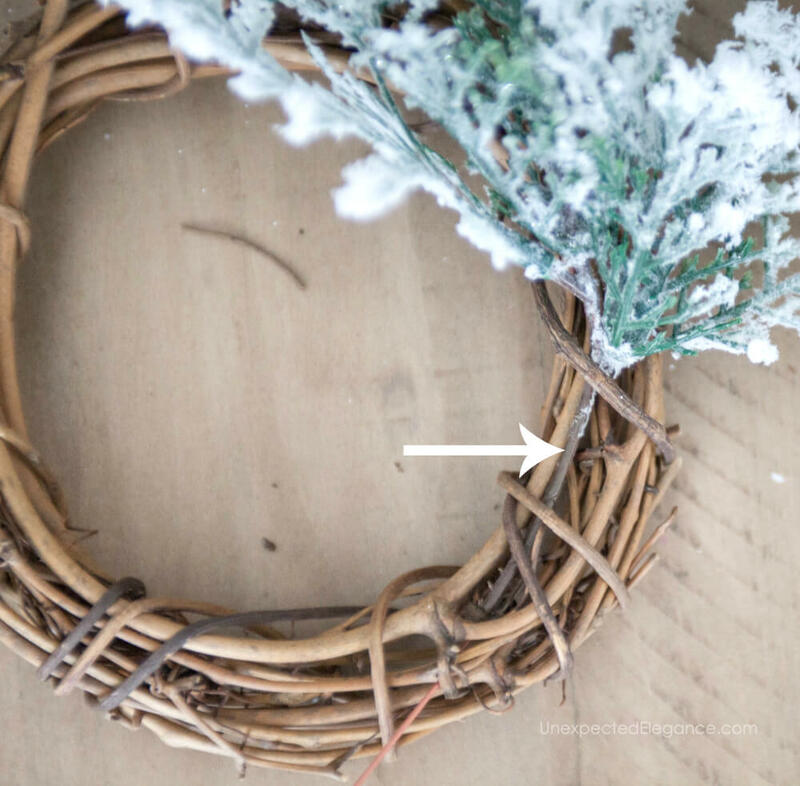 To make the wreath, take a few picks and push the stems into the grapevine wreath. I like a modern look with only half of the wreath covered in florals, but you can make it however you like. You can also break up the sprigs and use some wire to hold the smaller pieces in place. 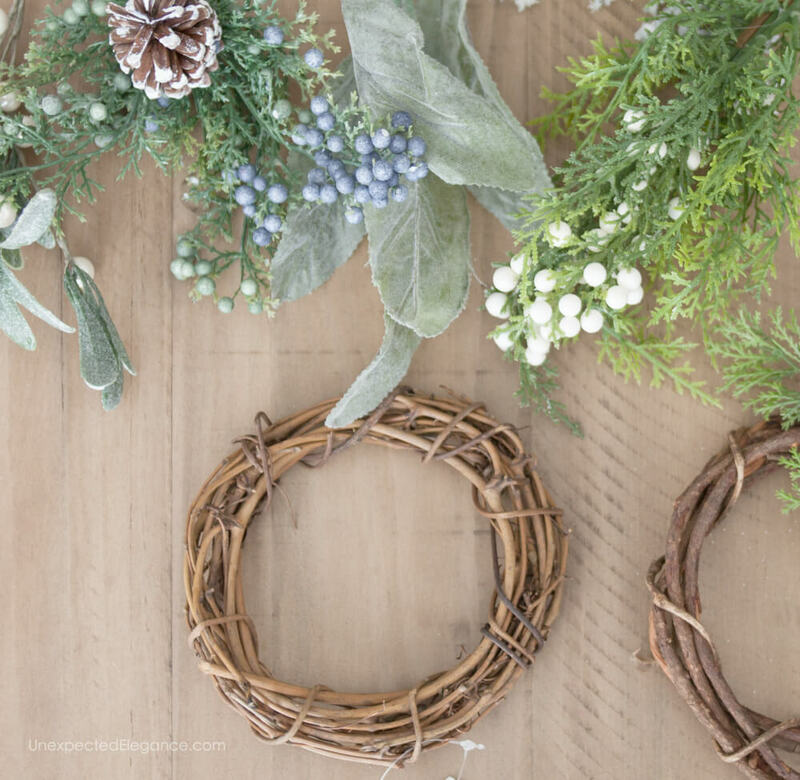 These miniature wreaths are so cute and only take a couple of minutes to create! I added name cards to mine using a heavyweight foil and metal stamp set. I just created a template out of paper, then traced the shape on the foil. After I stamped each name, I used a black permanent marker to fill in the grooves. I folded each side to create a more three-dimensional shape, like a banner. I finished out my table setting with a very simple centerpiece. I used a shallow ceramic bowl and filled it more faux greenery sprigs and then topped it with a few ornaments…it’s simple and elegant. TIP: Remember to always keep your centerpieces short, so that your guests can see over them. You don’t want your decor making it hard for people to talk across the table! As always, just keep things simple. Having people in our homes should be more about hospitality than entertaining, so when we keep things easy it helps us enjoy our guests more! Your decorations are always so beautiful and easily done. Thanks for the simple elegance of each. Thanks, too, for the JoAnn opportunity! Thank you for your inspiration. I’ve never used my metal alphabet stamp set. It would be a blessing to win the Joann gift card! There is elegance in simplicity and your table is beautiful! Love the gift idea as well. Simple, but a lovely reminder of a happy gathering at the home of a thoughtful hostess. Thanks for the inspiration. Happy Thanksgiving! days have been pleasant, and while I pray that He hears me when I cry out for His help, I do forget some days to give Thanks for the days that go well. 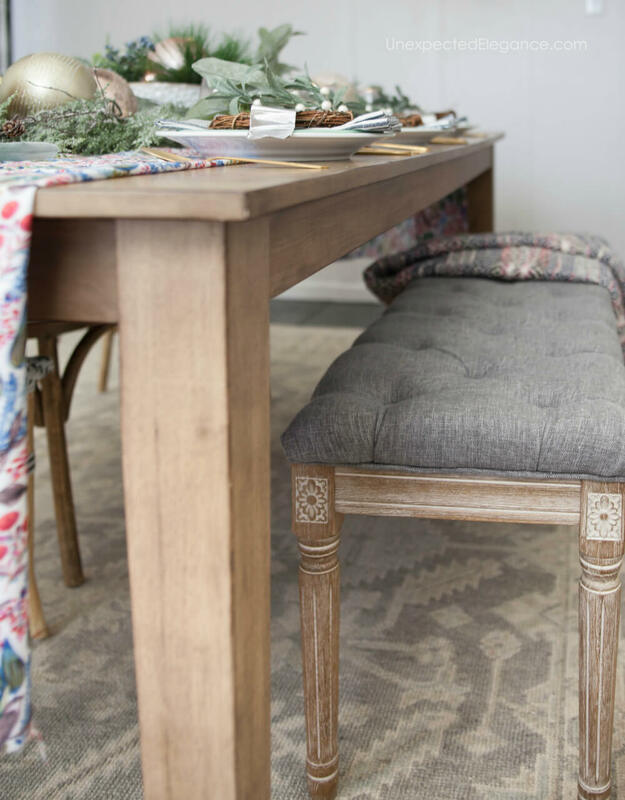 Secondly, I love the softness your tablescape gives for this time of year as we transition not only seasons, but times of enjoying working with nature outdoors to merriment with family and friends indoors. 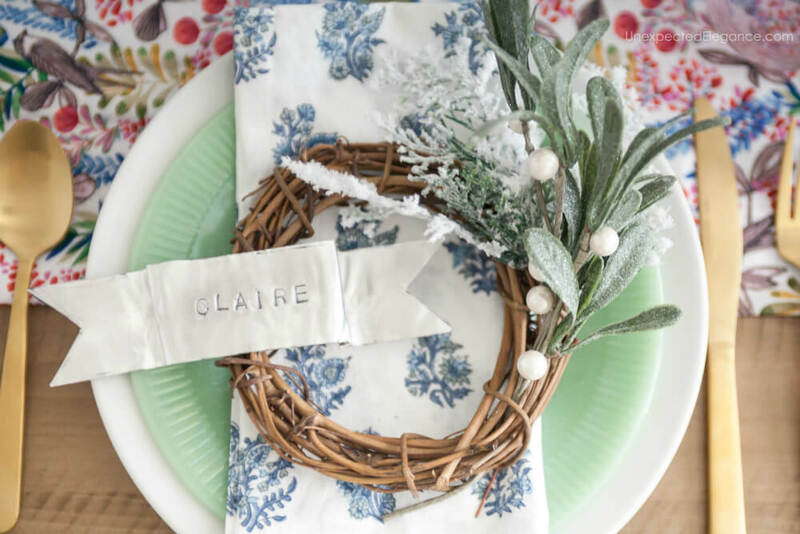 Your small gift wreaths are a delightful idea for a ladie’s Christmas luncheon! My husband died last year, but I find blessings everywhere. He loved me unconditionally, so I smile far more than I cry. Every day brings much to be grateful for! Thanks for your uplifting posts. Love all your ideas–you’re so inspirational! I love your colorful Christmas table setting. 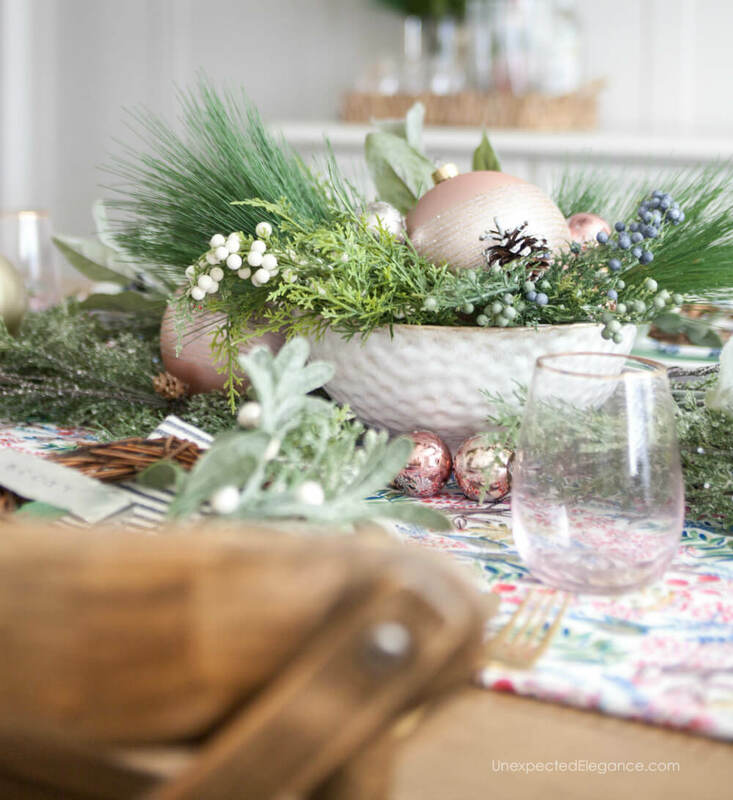 I love adding centerpieces and table runners to brighten up my Christmas dinner table! Thank you for the beautiful inspirations!